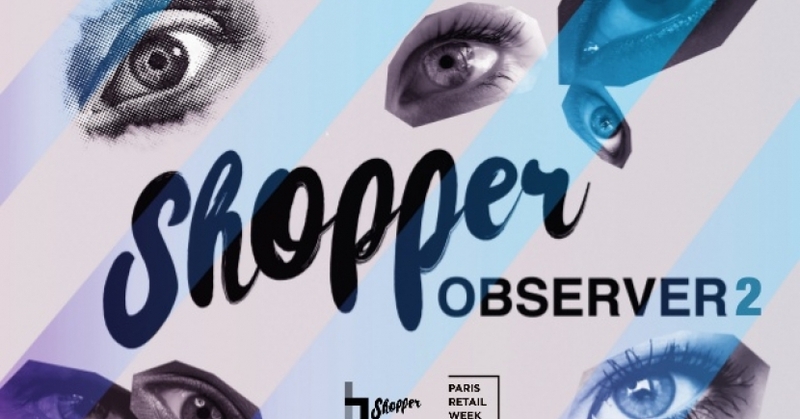 Paris Retail Week presents the second part of its Shopper Observer Havas Paris insights, the watchdog for consumer behaviour and trade innovations, hand-in-hand with Havas Paris. Global flagship event dedicated to trade professionals, the third edition of Paris Retail Week throws open its doors from 19 to 21 September next at Paris Expo Porte de Versailles. After having announced, back in May this year, three key retail trends observed in 2017, with a new focus firmly centre staged on the human aspect, Paris Retail Week presents the second part of its Shopper Observer Havas Paris insights, the watchdog for consumer behaviour and trade innovations, hand-in-hand with Havas Paris. Contrary to the fears of the ineluctable advancement of digitalization and the appearance of artificial intelligence, considered as a revolution by 64% of French people (source: Havas Paris-PRW-OpinionWay, July 2017), this has not led to the fade-out of physical stores. We are witnessing the reinvention of points-of-sale, on a quest for meaning and groundbreaking interactions with the consumer. Pioneering store concepts are springing up across the globe, where stores are no longer just average sales outlets but real showrooms for experiences. This is also obvious through the prominence given to employees who now play a key role in consumer interrelationships. Employee involvement and commitment have become factors for setting brands apart. This third edition maps out the changing trends of trade. Trade where the pervasiveness of everything digital now makes it necessary to bond more with the consumer and win their confidence. Trade where the human aspect is more-than-vital, both online and offline. Trade where it is crucial to become part of the consumer’s life, smoothly, seamlessly. Trade where highly-distinct strategies and pathways to success can be implemented. But trade which, more than ever before, needs to prove its added value and live up to expectations of fluidity, closeness and emotion. “Consumers are not willing to enter a cold, discarnate relationship induced by the advent of digital and artificial intelligence. They want to enjoy rich, uncompromising consumer experiences. Human-focus, sharing and commitment are increasingly meaningful notions for these consu-citizens. Their request is clear: Tomorrow’s trade must be re-humanized”, emphasizes David Mingeon, Deputy CEO of Havas Paris. For a long time, convenience was determined by store comfort. Now, thanks to innovations, it is based on shopping experience fluidity and the ability to become part of consumers’ life smoothly, seamlessly, to the point where, occasionally, the store or the website is virtually faded out. In e-commerce, this new convenience is illustrated through “seamless” integration in everyday life, acclaimed by both Millennials and seniors. As such, new solutions which simplify purchasing and repeat purchasing are springing up, from automated purchase buttons like Amazon Dash buttons, to connected fridges, and even subscription solutions for everyday essentials. In physical trade, this quest for fluidity can be seen through the elimination of payment-related points of friction. The concept of payment by registration plate, tested in Auchan hypermarkets, the checkout process in Amazon Go stores, the introduction of lockers in public places – stations, shopping centres, even fitness centres – where you can pick up parcels much more easily and even delivery robots... illustrate this trend. With practices moving towards smartphones, e-commerce has had to be reconsidered. This involves using websites less and switching to an increasing number of messaging- and social media-type apps. The growing importance of m-commerce via instant messaging and social media is likely to become one of the new online commerce standards, in particular for younger generations. Internet’s leading players have become highly aware of these opportunities. Pinterest rolled out its buy button mid 2016, Facebook launched its marketplace in 2016 and Instagram initiated an experiment focusing on shoppable tags with some twenty brands. A myriad of brands have also taken the plunge with this trend. Following on from its purchasable items launched on Snapchat, Sephora has been developing a solution where customers can buy via messaging apps (Facebook Messenger and WhatsApp, for example). In a hyper-digitalized world, Millennials attach great importance to their peers. Distinction has often been determined by the offer and the price yet, today however, it is based increasingly on employees. One of the paradoxical effects of trade digitalization is the fact that employees now play an ever-more central role and have passion as a catalyst for engaging consumers. As standard-bearers of brand values, employees are deemed to have a key role to play in strengthening brand/customer relationship; 81% of consumers believe that it is important or very important for brands to embody sound values and some 65% of consumers believe that having a clear set of values helps businesses become more profitable1. The powerful development of digital and expectations as regards fluidity have resulted in reconsidering the role of the store and in imagining concepts which are, seemingly, less directly trade-related but nonetheless highly profitable. These new stores are places where consumers – and Millennials in particular – like to spend time and consume. To meet the requests of these new consumers, stores mark their difference by hosting concerts and art-focused events or by integrating an in-store restaurant. Other leading distributors have been inventing ambitious concepts which transform their points of consumption into living spaces. Such is the case for Carrefour which has innovated in Italy and opened a new version of its proximity concept in Milan. “Express Urban Life” is not just a store but a “restaurant” integrating eat-in or take-out fast food codes, a lounge area which invites consumers to relax and a coworking space. “French people want a different kind of store, which addresses their numerous and varied expectations. A real challenge for retailers. This willingness is apparent in the emerging paradigm of Live Retail, the main theme of Paris Retail Week. Live Retail is a more human, authentic store which places human beings with their emotions and with experience at the centre, whilst at the same time taking new intergenerational expectations into account”, emphasizes Sophie Lubet, Retail Business Unit Director atComexposium. A real hub for emotional connections, the store of tomorrow inaugurates a new era privileging human relationships yet at the same time building on digital services. The point-of-sale promotes bespoke solutions, innovation and creativity to offer its customers more than ever before. Henceforth, the store is a place for sharing experiences, information, feelings and distractions; technology makes the retail space a fun-filled, captivating place. In July 2017, the Havas Paris-PRW-OpinionWay survey questioned a panel of 1,000 individuals (18 years old and over) online, using a set of 17 omnibus questions.